The Road to BlizzCon passes through New York City on October 5 and 6, when some of the best Hearthstone and World of Warcraft players in North America will gather to slug it out in the regional finals. Free tickets are now being offered at Eventbrite, and yes, you would be correct to point out that attendance is free for all anyway. But an RSVP will also net you some goodies, if you're near enough to the front of the line. The first 1500 people to register to attend the qualifier on either Sunday or Monday will be given three free Hearthstone card packs, while the first 500 to register specifically for Sunday will also get a Warlords of Draenor beta key. The difference comes thanks to the action on stage: The Blizzcon qualifier will see both Hearthstone and World of Warcraft action on Sunday, while Monday will be reserved exclusively for the Hearthstone throwdown. 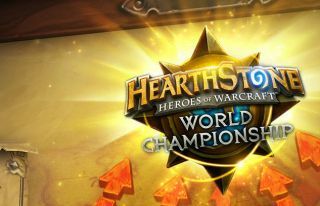 The North American qualifier will feature the top 16 Hearthstone players from North America, including StrifeCro, Hyped and Tarei, and the top eight World of Warcraft teams. The top four Hearthstone players, and the top three WoW teams, will make it to the finals at Blizzcon 2014, running November 7 and 8 at the Anaheim Convention Center in California. The EU Regionals, meanwhile, are already underway: The first day of competition ended yesterday with upset losses for both Reynad and Lifecoach, but hot favourite Kolento progressing 3-0. The action continues on September 26 and 27, and you can get more info on the exact timings here. The image below should give you a sense of how the (fairly convoluted) qualification process is playing out. Obviously PC Gamer will be rooting for our boy Hyped.